If you are planning a trip to Tuscany here area 10 things which you simply cannot miss! Any time of the year is valid for this activity; however, probably the best time is between the months of April and November, which is when the vines are at their best. There are thousands of places to do a wine tasting although, from my point of view, there are three particularly attractive areas. The first is the area of Brunello (near Montalcino), the second is the Vino Nobile (Montepulciano) and obviously the last is the Chianti region. All three are very different and equally beautiful but if you like the historic castles Chianti is surely the most beautiful in this sense, whereas if you like landscapes and hills that are lost to the horizon then the best area is probably Brunello and Vino Nobile. Tuscany is a land rich in thermal spas, which are found throughout the region. If you prefer a more Spa type of thermal baths then you should visit the Querciolaia Rapolano Terme di San Giovanni or, instead, if you prefer baths in the middle of nature then you can visit BagnoVignoni and especially those of Saturnia, known worldwide for their beauty. This activity can be done throughout the year. A particularly magical moment is a snowy winter evenings spent in a thermal bath. For those lucky enough to enjoy their holidays at this time of year the most beautiful view is located in southern Tuscany. Balloon tours are usually very expensive, about 250-300 euros per person. However, they are a very nice investment in your memories and an emotion that your loved one will remember for a lifetime. 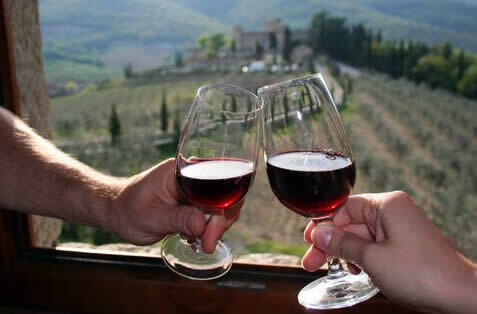 The prettiest tours are those which are carried out in the area of Siena, specifically in Valdorcia. Seeing Tuscany from a hot-air balloon in perfect silence, watching beautiful vineyards, castles and small towns is something that you will remember forever as a truly magical experience. This type of activity can only be done with good weather conditions, therefore, the time of year that I recommend would be between the months of May and September. All of the Tuscan coast is especially nice but the southern region from Talamone to Mount Argentario is beautiful, particularly reaching its peak on the island of Elba. This island is located a short distance from the coast and can be reached by ferry and would make a lovely one day excursion. Elba has magnificent beaches with beautiful fondales where you can enjoy the beautiful sea of Tuscany. This activity is ideal from June to September. Both museums are in Florence, the first was built by the Medici family and preserves many works of art that the lords of Florence collected over hundreds of years. The Accademia instead retains the world famous emblem of the city and Tusany; Michelangelo’s David. A visit to these places is complimented by a comprehensive visit to the city of Florence. This activity can be carried out throughout the year. A visit to the Cathedral of Siena and the city in general is something that should be included in a visit to Tuscany. The Cathedral of Siena is positively amongst one of the most beautiful of all Christianity, and incredible works of art are preserved inside. The visit to the Cathedral can be complemented with a walk through the amazing old town accompanied with a coffee at one of the many bars that surround its beautiful Piazza del Campo. Enjoy a unique experience with a sunset on the square. This type of activity can be done at any time of year. All secondary roads of Tuscany have their charm, however, Crete Senesi is one of my favorites because of the sweet silhouettes of its hills which make this place a true Tuscan feast for the senses. Another wonderful route is the Valdichiana, which could start from Bettolle. The first part of the route is going to Lucignano and then continue to Cortona and Lake Trasimeno. The last route I would propose leaving from Bettolle, which passes through Valdorcia, where people have taken the most photos of Tuscany which you will find online. Stops along this road will include Montepulciano and Pienza whilst enjoying the people of Valdorcia. These roads are very nice at all times of the year, in winter with snow and fog in the background it is very beautiful, especially during the misty mornings. Known for its beautiful and well preserved towers San Gimignano can be considered as the New York of the Middle Ages as its rich merchants used to build ever taller towers as a symbol of their power and wealth. Today many of these are still preserved and a walk in San Gimignano will take you back in time. The city also retains a beautiful cathedral. From the top of the village you can enjoy beautiful views of the countryside and vineyards that surround it. This activity can be made throughout the year. Did you like it? To deepen your knowledge you can also visit their website: Dario Cecchini. This activity can be done throughout the year, if you want to visit Dario please visit his opening hours on the website. I could not finish this article without mentioning one of the most famous sights of Tuscany and Italy in the world: the leaning Tower of Pisa. You will enter a spiral staircase that takes you to the top. You may become a little dizzy and tired but your effort will be worth it for the view from which you enjoy, and it is so incredibly beautiful that this view gave the name to the square under the tower “Piazza dei Miracoli” (Square of Miracles). This activity can also be done throughout the year. With this tenth activity and leaving many others in the pipeline I close this blog. As always I hope that this article will be useful in organizing your trip to Tuscany. If you like what you read please help my blog by pressing the G+ button to recommend to Google so that I may keep writing and helping other travelers like you!